This year marks the twentieth “World of Mutsumi Nakanishi” exhibition at Gallery Sakuranoki. Nakanishi is the artist regarded by clients as the most “collectable” on our books. We spoke with him about his work. Born in Nara in 1947, Mutsumi Nakanishi studied oil painting at Kanazawa College of Art before moving to Tokyo in 1972. Around 1985 he switched from painting in tempera and oils to an original technique of painting, followed by washing. Currently lives and works in Kamakura. From glorious Nara, to the brooding overcast skies of Hokuriku: Nakanishi went to study oil painting at Kanazawa College of Art, but on seeing the oil paintings of the Western masters, it struck him that there was no way he could paint like that. Even the thought patterns of those artists were different, completely alien. 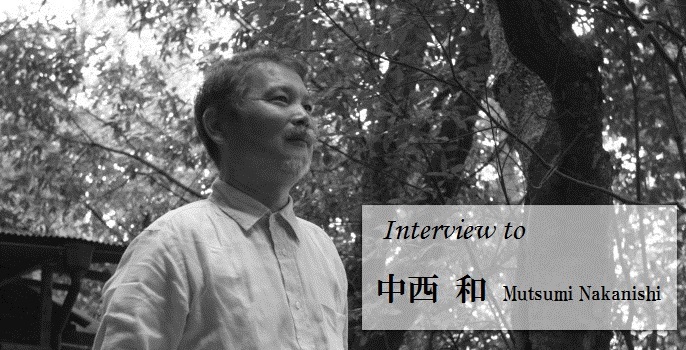 Nakanishi says it was thanks to the rotating eraser that he discovered a way of rendering “white” that matched his own sensibilities perfectly. He hit upon the idea of expressing “white” not by applying white paint to represent brightness and light, but by scraping the paper, adding air to produce a “white” integrated with an airy light. His first step was to race off to a DIY store. Next, he searched for paper that would allow him to do what he wanted. This technique is very tough on the paper. Washi paper treated or “sized” to stop smudging and running would be problematic. Western-style paper or watercolor paper seemed to fit the bill. But what about grays to show gradations of light and dark? Ivory black goes moldy, and doesn’t form an attractive gray even when spread thinly. Sumi ink, which has grains much finer than those in pigment, will do the job. But if you apply sumi ink to the surface of watercolor paper, it never soaks in comfortably like on washi, no matter what you do, and never looks good. So, you have to wash it off. A work is created through repeated painting and washing.